I recently came across these digital photos of the creation of a work I have on display at the Burnham Grapevine Gallery in North Norfolk just now. Titled simply ‘Red landscape’ it is approx 40x40cm, acrylic/mixed media on canvas like a lot of my work. I thought it might be interesting to show how the painting evolved. Obviously step 1 above sees the work some way on in its progress. 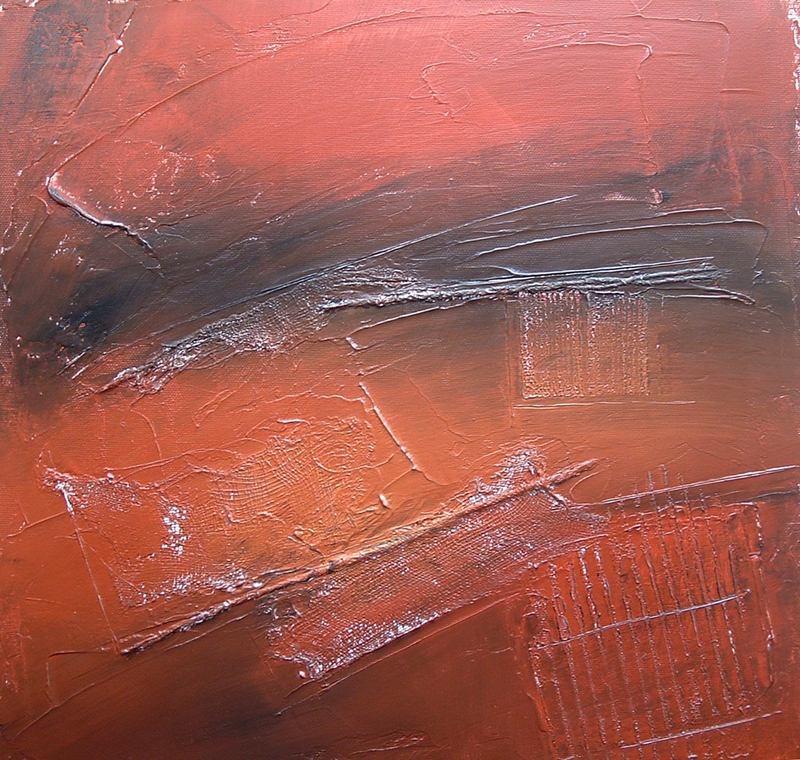 I started by covering the box canvas with a smooth texture paste that I use, spread liberally and loosely with a palette knife. Before this dried I embedded various materials into it such as fine muslin and string, also pressing pieces of corrugated cardboard (peeling off the covering layer on one side, revealing the ridges) to create interesting areas of texture. Then, using a large (4 inch) soft brush – I applied a mix of burnt sienna and yellow ochre mixed with matt medium all over. When that was almost dry, I swept paynes grey across parts of the upper middle and lower foreground, resulting in the above image (step 1). 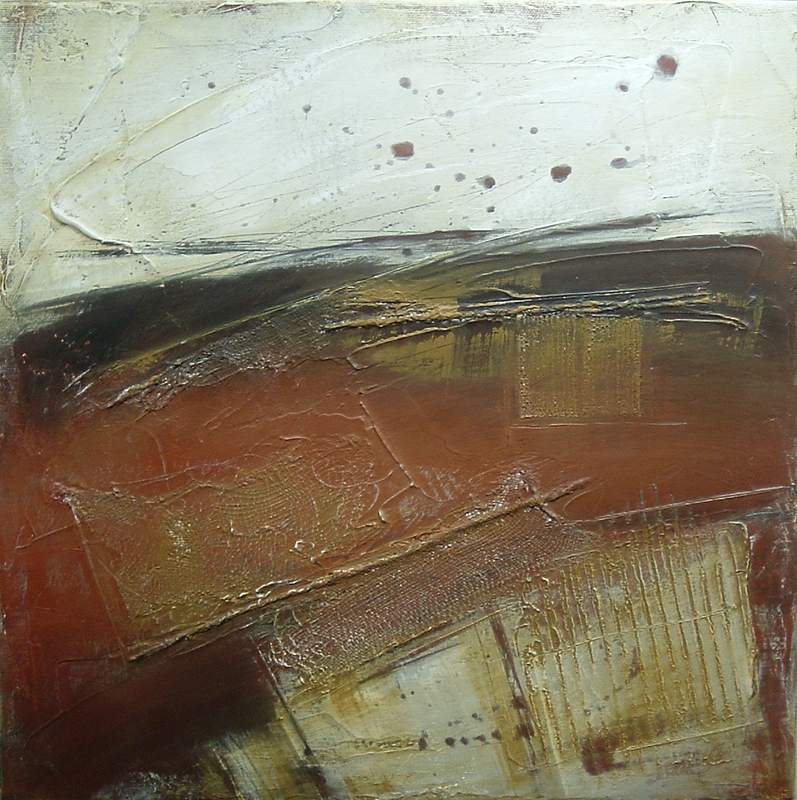 In step 2 above, the sky area, horizon and foreground are suggested with parchment (a pale cream colour I find a bit gentler than white) giving some definition to what I could now visualise as a fieldscape, albeit an abstracted one. This was allowed to dry thoroughly. 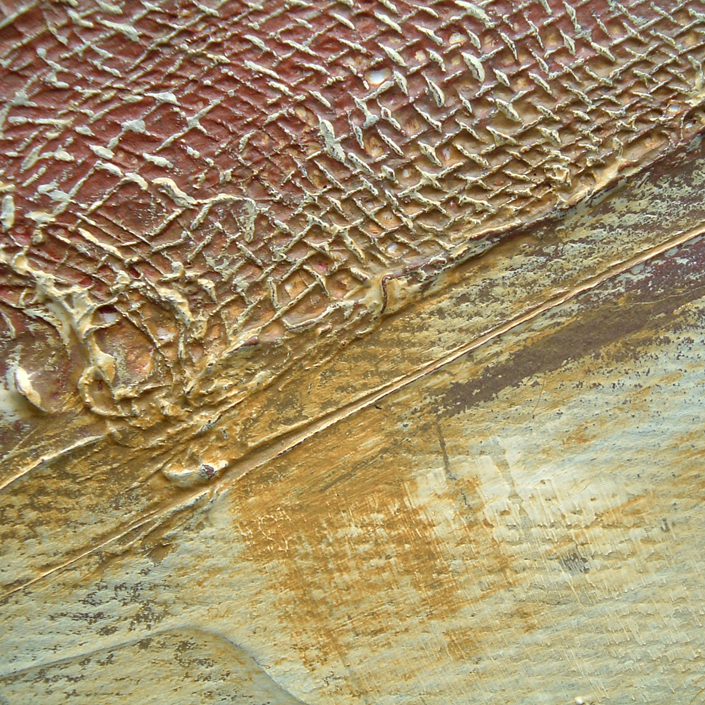 Step 3 demonstrates the rather drastic technique I often use of sweeping darker paint over the canvas with loose strokes concentrating on getting into all those bumps and ridges of texture. Before it dries I wipe most of it away with damp rags (have to be pretty quick here). Although this may seem a waste of time (and paint!) I find it gives a subtle depth to the final painting. Incidentally I use a hairdryer to speed up drying times for most works. I then warmed up the painting with more burnt sienna and yellow ochre mix, and yellow ochre on its own, used fairly dry so it retained the brush strokes, to indicate ‘field’ areas. The finished work is shown below and also a close-up detail showing how the paint clings to the texture of the muslin etc. 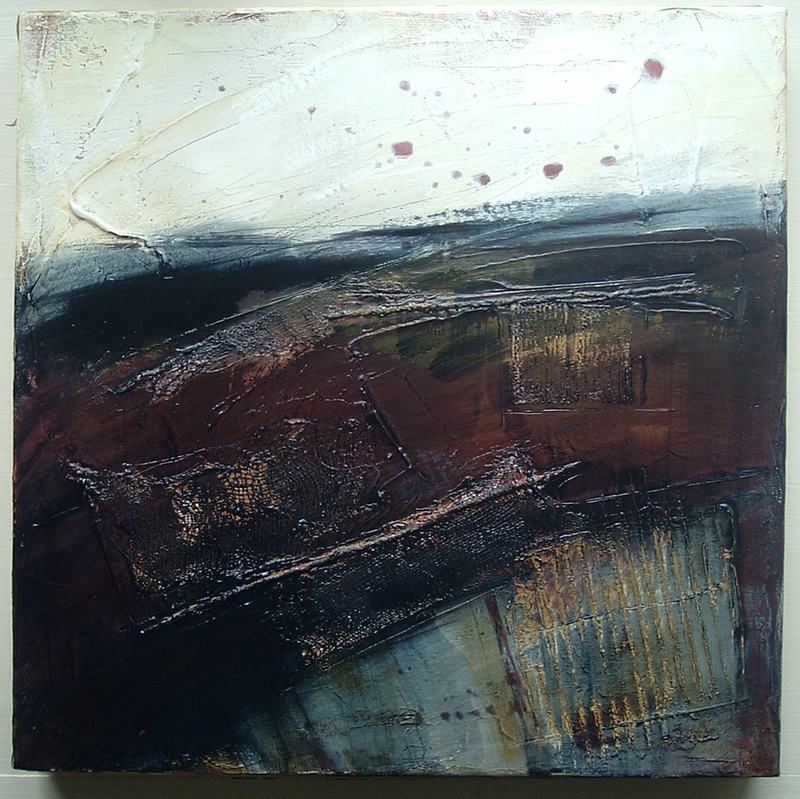 This entry was posted in Uncategorized and tagged abstract, acrylics, art, artist, burnham market, canvas, demonstration, fields, fieldscape, foreground, gallery, grapevine, horizon, landscape, material, mixed-media, muslin, norfolk, painting, red, sky, step-by-step, techniques, texture, tutorial by mari french. Bookmark the permalink. Thanks Elaine. Muslin is wonderful, as is ordinary garden string. the muslin can be pulled and torn and frayed too, with the little resulting strings being particularly interesting trailing across part of a painting. I’ve recently tried a very loose hessian (intended as garden sacks for leaves) which is interesting too, although not as subtle. On my new saltmarsh board paintings I’ve been crumpling (strong) tissue and pasting it to watercolour board before painting on it with acrylics, which also gives lovely texture. Am becoming quite a womble collecting bits and bobs of stuff I can use – I love mixed-media!